When I was in high school, I wanted to be a virologist*, a disease hunter for the CDC. The Hot Zone: A Terrifying True Story, And the Band Played On, Outbreak, and The Andromeda Strain were rather influential texts. Then I realized that I have a pretty crap immune system, so it probably wasn't the best career path to choose. BUT! I do still enjoy a good virus-hunting thriller, something that I had kinda forgotten about until we rented Contagion a few weeks ago. Fresh off my "what is killing everyone? Smart people will figure it out!" 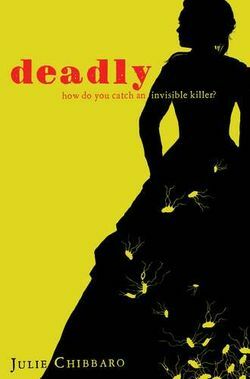 high, I remembered that I wanted to read Deadly. So I did. Prudence Galewski isn't like most of the other girls in her finishing school. She wants to know real things. Science things. She wants to know why people die and how it can be stopped. She had to watch her brother die after a carriage accident when his wounds became infected. Her mother is a midwife and Prudence often helps-- why do some births go well and some go so wrong? She applies for a job a secretary at the Department of Sanitation and Health. She's hired to do more than take notes, but to take an active part in an investigation in a new series of typhoid outbreaks. Soon, the only thing linking the outbreaks together is an Irish cook named Mary Mallon, but Mary's never had typhoid, so she can't be making everyone sick, can she? An excellent look at the investigation that brought in Typhoid Mary and the controversy surrounding it-- a controversy dealing with personal rights, crazy ideas in science, and discrimination against immigrants. It's not as fast-paced as the books and movies I mention above and it's not gross (there are NO descriptions of what happens during typhoid!) but I still really liked it. I liked how Mary was a real person, not villainous joke she's become. I liked the relationship that Prudence has with her mother-- there are a lot of walls (but no acrimony) between them at the start of this book and it's interesting to read how their relationship grows and changes over time. A very solid historical fiction novel about something that we don't often read about. Also! I like the original cover, but I have to say I think the new paperback cover is much more exciting and enticing to readers. Oh, and here's an excuse to link to Hark! A Vagrant! 's cartoon about Dr. Sara Baker, who is a character in the book. *A (guy) friend of mine initially thought this meant I wanted to study (male) virility.